It feels like a very long time since I've written a review on this blog (a full one at least) and while I have been seeing some shows, Apologia at Trafalgar Studios is the first one this month that I really feel like writing about. 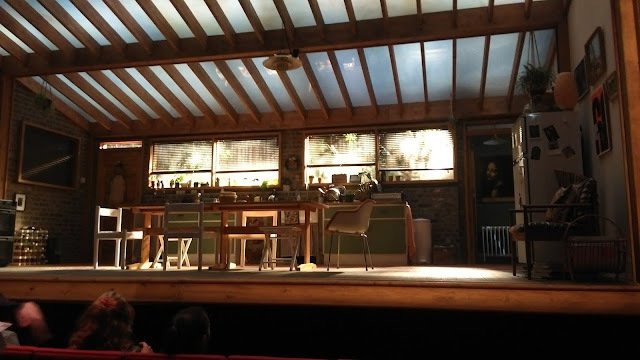 First of all, I have to say a word about Trafalgar Studios as a space: I've now seen three very different plays here, all of which I've enjoyed and all of which have used the space in completely different ways. I know for certain that I'll see more productions here and that I'll continue to be impressed. Now, onto Apologia! Written by Alexi Kaye Campbell, the play tells the story of a family dinner party to celebrate art historian Kristin Miller's birthday but thanks to her recently published memoir, the night doesn't go to plan and the deep wounds in the family's relationships are exposed. It's a darkly comic script that is brought to life by some truly wonderful acting all round. 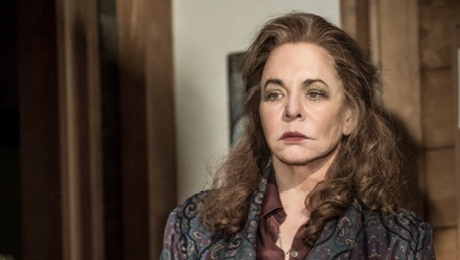 Stockard Channing (of Grease fame) was astounding as matriarch Kristin - her deadpan comic delivery had the audience in stitches (and herself at one point too!) but there were also powerful moments of raw emotion and as the final lights faded, my eyes were full of tears. Joseph Millson played both sons during the piece and very effectively differentiated between the characters of Peter and Simon. I really got the sense from the start that as Peter, he was holding back which made the burst of passion we saw towards the interval work brilliantly. As Peter's partner Trudi, Laura Carmichael was also excellent, beginning as a bland, overly-keen American but developed into a more defined, and actually essential, character. I also enjoyed performances by Desmond Barrit as Hugh, who brought a lot of comedy and light relief in the darker moments, as well as Freema Agyeman in the role of Claire who really embodied the role of a soap opera actress, with her outlandish personality, while also packing in some real fierceness and vulnerability at times too. I also just want to add how much I loved the set for this piece. The space is Kristin's kitchen, where all the action takes place and although it was static, it was fascinating to watch. The attention to detail was really special and I loved the windows to the outside world where subtle changes in light and weather occurred as the night went on. I left the theatre with a huge smile on my face. It wasn't what I was expecting but all elements of the piece were so enjoyable and I would really recommend checking it out while there's still chance. The play is running until the 18th October and you can find tickets and more information here. I'm Olivia, a 21 year old theatre enthusiast. This is my little corner where I share my love of dramatics with reviews and recommendations. 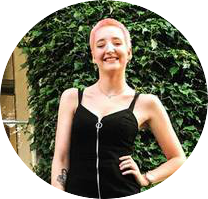 © Olivia Loves Theatre | All rights reserved.